Replaces damaged or broken headband cables. 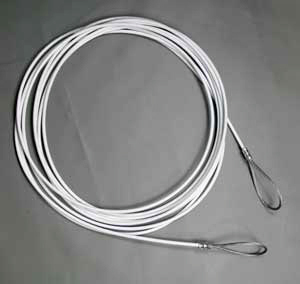 5/32" vinyl coated to 1/4"
If possible, with tape or wire, attach the replacement cable to one end of the existing cable before pulling the existing cable out of the tennis net headband. This will pull the new cable inside the existing net.